Bentley is a recently adopted 8 year old, neutered male Aussie. His owner’s concerns were hind limb weakness, quivering and difficulty getting up. 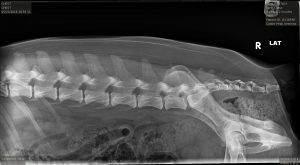 After multiple treatments with acupuncture and laser that targeted sensitive areas of his mid to caudal thoracic spine, hips and stifles, he appeared to have more fluid movement and less quivering. However, he had continued weakness and difficulty standing up. Radiographs taken after the first series of treatments showed non-union fractures of the dorsal spinous processes of T6, T7, T8 and bridging spondylosis of T4-5, T5-6 and T6-7. My plan moving forward has been to continue treatments to facilitate healing of the non-union fractures and to continue to improve strength, comfort and function. Bentley was previously owned by a marathon runner and was his running companion. When the owner moved to Eagle, Colorado from California, last year, he had little time for Bentley, and he was given up for adoption. His only pertinent medical history is that he was diagnosed with epilepsy, three years prior that has been controlled by phenobarbital. Bentley now lives on a ranch, since January 2018, is active and loves to run behind his new owner Dayna’s four wheeler. He first presented to me on January 21, 2018, after Dayna had had him for 2 weeks. She described him as very active, strong once moving, but nervous and anxious. His rear limbs quivered constantly and he was slow getting up. 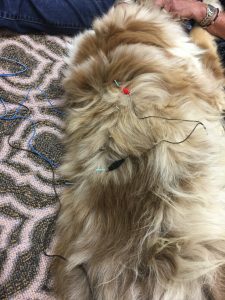 I initially used Bentley, with Dayna’s permission, to practice acupuncture techniques before I did my Curacore clinical intensives. Subsequently, I decided to use him as my case study. 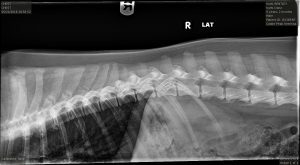 Bentley’s initial physical exam, on January 21, 2018 showed a slightly overweight, alert, responsive, sweet but anxious, 8 year old, neutered male Aussie. His gait was stiff in the rear limbs and he favored his left over his right rear limb. His hind limbs quivered constantly and he had some difficulty getting up. He was tender over the T6-T7 region, his hips and both stifles. The rest of his PE and all previous labwork were unremarkable. I reevaluated Bentley on May 20, 2018, at which time I did a thorough myofascial and neurologic exam. My general impression of his gait was of a good head carriage with no head bob, flat top line with hips that swayed from side to side. He had difficulty getting up and was reluctant to sit down. He has a thick, fluffy coat which was flattened over the mid to caudal dorsal thoracic region. Upon palpation, his pectoral muscles were well developed with taut bands. His forelimbs had good muscle tone with taut bands in his biceps muscles. His latissimus dorsi muscles were very developed with taut bands over his left ribcage. His shoulders had well developed muscles with tight bands in his trapezius and rhomboid muscles. His left pelvic limb was quivering. He had atrophy of his left gluteals and hamstrings and tense quadriceps and gastrocnemius muscles. He had tenderness to palpation of his left stifle with thickening at the medial aspect of the joint. There was no joint effusion or cranial drawer sign. His right stifle was very similar to his left. However his right pelvic limb did have good muscle tone. He had no pain upon palpation of his sacrum or hips. Upon evaluation of his vertebral column and paraspinal musculature, he was quite tender and did flinch upon palpation over his dorsal mid thoracic region with trigger points extending from his mid thoracic down to the upper lumbar region. The neurologic exam showed an alert responsive dog with no cranial nerve deficits. His patellar and sciatic reflexes were normal to brisk bilaterally. He had normal withdrawal of all four limbs with no crossed extension reflexes. His conscious proprioception (CP’s) was mildly and equally depressed in both pelvic limbs. All labwork, which included CBC, chemistry panel and phenobarbital levels, were within the normal limits. On June 21, 2018 x-rays of the thoracic and lumbar vertebrae, hips and stifles showed lipping at lateral tibial condyles bilaterally, non-union fractures of the dorsal spinous processes of T6, T7, T8 and bridging spondylosis of T4-5, T5-6, T6-7 with mild changes at T7-8. VASCULAR: Fibrocartilaginous embolism to L pelvic limb, poor circulation at fracture site. INFECTIOUS: Discospondylitis, osteomyelitis. NEOPLASIA: Spinal column, vetertebrae. DEGENERATIVE: OA, IVDD. 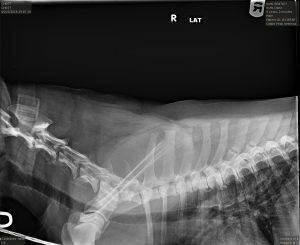 INFLAMMATORY: OA, IVDD. CONGENITAL: Congenital stenosis of spinal column, epilepsy. AUTOIMMUNE: Stifle OA. TRAUMATIC: Blunt trauma, repetitive use trauma. METABOLIC: Cushings, Diabetes Mellitus. 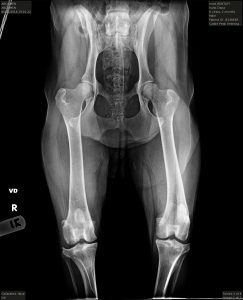 My definitive diagnoses are based upon history, physical, myofascial and neuro exam, labwork and radiographs and response to treatment. These include thoracic vertebral trauma causing the non-union fractures and spondylosis seen on radiographs but also picked up on MF exam, thoracic spinal nerve injury causing pain, UMN signs to both pelvic limbs and compensatory changes diagnosed via MF and neuro exam and radiographs, left sciatic nerve dysfunction based on MF exam findings of shaking, weakness and muscle atrophy of gluteals and hamstrings and congenital epilepsy based on history, breed and age of onset. My medical approach to Bentley’s issues is to improve circulation, reduce inflammation and pain in the affected tissues, release TP’s, stimulate nerve function, facilitate bone healing and strengthen the muscles involved via neuromodulation of the peripheral and central nervous systems and balancing of the autonomic nervous system. Stimulation of local points are used to block nociceptive pathways thereby reducing spinal cord wind up, stimulate release of local endogenous opioids and other factors, improve local circulation, normalize function and allowing healing to occur. Balancing the ANS to reduce sympathetic and increase parasympathetic tone throughout the body will further enhance these local effects. Ultimately, all of these points connect to the central nervous system via the spinal cord and to the brain which then feeds back to the entire nervous system further alleviating chronic and neuropathic pain. I will be using dry needling, electroacupuncture (EA), photobiomodulation (PBM) and massage to achieve my objectives. I realize that I may not always be able to complete the desired treatments because of my patient’s agitation, anxiety or positioning; however, between a regimen utilizing multiple modalities, frequent treatments and a willing client, I hope to help my patient heal and make him more comfortable and functional. The acupuncture treatment will focus on the issues identified in my definitive diagnoses. My priority is to address the mid to caudal thoracic veterbral and spinal lesions, pain and compensatory TP’s. My needle choice is the Seirin J type .20 x 30mm (blue) and .18 x 30mm (yellow) needles. To neuromodulate (NM) the central nervous system (CNS) I will dry needle GV20, GV14, Bai Hui and points along the bladder line (BL15-BL23). These same points along with ST36 will be used to balance the autonomic nervous system (ANS). For peripheral points I will EA BL15-BL23 points bilaterally to block nociceptive pathways, improve circulation, reduce inflammation and facilitate healing of fractures. EA will be applied for 15 to 20 minutes using frequencies of both 10 and 100 Hertz. I will dry needle BL35, at the end of the spinal column, BL60 and KI3 as distal points. GB21, BL14, and BL15 will be used to release shoulder TP’s, LU1 for pectoral TP’s and SI9 and LI11 for forelimb TP’s. To address UMN signs to the hind limbs, along with the aforementioned treatments I would dry needle using yellow Seirin needles additional points BL27, BL28 centrally, ST36 for its parasympathomimetic effects, and stimulate the peripheral nerve pathways at BL25, BL27, BL28, GB31 and the bafeng points (using Seirin .16 x 15mm) needles. In addressing the L sciatic nerve dysfunction I would use the same CNS, ANS and PNS points as for the UMN signs but adding GB29, GB30, BL54, BL36, BL40 BL60, KI3, and BL67 to stimulate the sciatic nerve from its proximal to distal end, glutes and hamstrings and distal points. I would consider E-stim from BL36-BL67 for both UMN signs and sciatic dysfunction. In addressing the stifle OA I would dry needle the same points to NM the CNS and ANS and add local points surrounding the stifle region (unilaterally, using spinal cord crosstalk) to improve circulation, reduce pain and inflammation and help stimulate proprioceptive function in both stifles.. These points would include ST34, ST36, SP9, SP10, BL40 and utilize the previously named distal points. I will be adding PBM therapy using my class IV Companion laser to bathe the tissues of the thoracolumbar spine, L glutes and hamstrings and both stifles with 6Watts, continuous wave for up to 15 minutes, and finish my treatments with moderate pressure massage. The plan is to start with three treatments 3-4 day apart, re-evaluate my patient and proceed with further treatments based on response. Bentley showed significant improvement after the first three treatments. His motion was more fluid and he was less stiff in his gait. He had less pain in his back, but he continued to be weak in his hind end. During the initial sessions, I had a difficult time keeping Bentley calm enough to complete the intended treatments. After a 17 day break I reevaluated Bentley and decided to get x-rays under sedation and resume treatments. I was able to consistently include EA for the next 4 treatments at 3-7 day intervals, at which point he showed more dramatic improvements. I have noticed an increase in the strength and muscle tone of his L glutes and hamstrings and decreased pain over his fractured dorsal spinous processes. Although his function is still not normal, he does seem to be moving more comfortably and getting up a little more quickly than before his treatments began. My plan is to continue to treat every 2-3 weeks and re x-ray his thoracic spine to assess healing. He has been on Previcox, fish oil and Cosequin since prior to his treatments, so I do feel that his improvements are due to the SMART’s. Over time I hope to be able to reduce his dosages of the conventional medications. Bentley has not been an easy case. Initially, his anxiety and agitation, along with loose skin and thick fluffy coat made him a very challenging patient. But over time, he has become happier, less anxious and easier to treat. I have learned that you don’t always manage to finish what you intend, you can’t force a patient to be calm when they are not, and although being a veterinary medical acupuncturist is very rewarding, it can be very frustrating if you don’t allow yourself to be flexible. In the beginning I was hesitant to use EA, but adding it to the treatments was a real game changer.